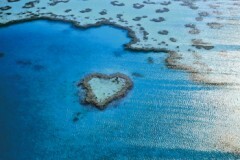 I found a very interesting puzzle, it is heart island in the Great Barrier Reef. The image is awesome but the format is very interesting. It is a1500 piece puzzle with a bonus 400 piece mini puzzle of a portion of the larger picture. This is an example of the 1500 + 400 puzzle. 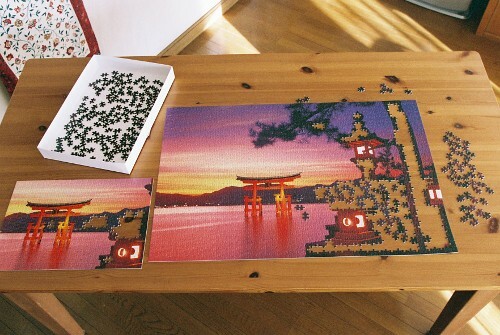 It is two puzzles in one, a 1500pc and a 400pc of the smaller section of the same image... love it! I don't get this...what is the point of having two puzzles of the same picture, even if one is only a mini version? I guess the challenge lies in trying to separate what belongs in the 1500 piece one vs. what goes in the smaller one? I don't know that I would enjoy doing that. Although to contradict myself, I have thought of doing the 3,000 piece version of the Life puzzle, but only if I end up donating the bigger one somewhere which is not likely since I want the satisfaction of having it on my wall and being able to "brag" that yes, I have completed a 24,000 piece puzzle! I certainly have not heard of anyone buying life, mixing all the bags, and then getting the smaller version and adding that in too! I suppose that would make things interesting! I just like the concept. I guess I like puzzling for the activity itself (versus having to love the pic but dont get me wrong, that helps). I live creative ideas and challenges with the puzzle. HOLY CRAP THAT IS AWESOME! WOW! Funny thing about puzzles, I have a friend in jail down here. She took a plea on a tax evasion thing years ago and just got sentenced to 6 months. Anyhow, turns out I could give her a puzzle to do so I did just that. You cant believe how happy she is, she started crying. She said it really turned things around for her (it was a bit of shock at the sentencing a week ago to all of us). Anyhow, she said it brought all the people together and made friends etc. It was so great that it could help people and they are just fantastic. Yeah, that is a neat story too. 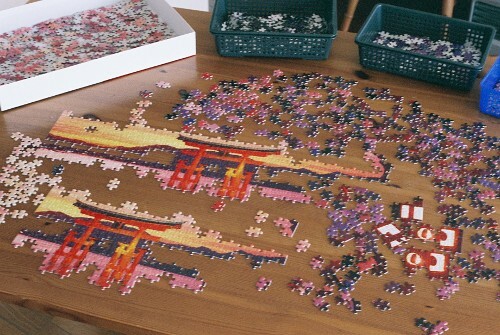 It's amazing what puzzles can do to bring people together. When it's large enough (like the kind we like to do), it makes it so much fun to have help. It's a great way to unwind, chat and catch up, and have lots of laughs while doing it. Everyone can work on something different.